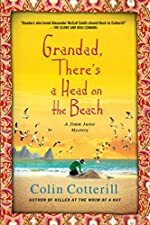 From Mysterious Reviews: Jimm reports on all manner of odd activities — such as finding a head on the beach — in a down-to-earth, matter-of-fact style in this second mystery of the series. But the story itself is far closer to "slice of life" than "novel of suspense", entertaining more for how Jimm goes about solving her collection of puzzles than for the puzzles themselves. When Jimm Juree's mother sold the family house and invested in a rundown 'holiday camp' at the southern end of Thailand on the Gulf of Siam, the family had little choice but to follow. Jimm Juree, who was well on her way to achieving her goal of becoming the primary crime reporter for the major daily newspaper in Chiang Mai, is less than thrilled to have lost her job as a reporter and to be stuck in the middle of nowhere where little of interest happens. So it is with mixed feelings that she greets the news that a head has washed up on the beach. It's tragic, of course, but this could be the sort of sensational murder that would get her a byline in a major daily and keep her toehold on her journalism career. Now all she has to do is find out who was murdered, and why.